I have visited Fiji four times: in 1975, 2004, 2010 and 2012. The friendly Fijian people are the main reason I travel so far to visit these islands. Of course, Fiji also offers the traveler lots of activities, beautiful scenery, ocean sports of all kinds, and some unique cultural experiences. Solar Eclipse Cruise 2012 – In addition to a wonderful solar eclipse cruise aboard the Paul Gauguin, I stayed in Fiji before and after the cruise. 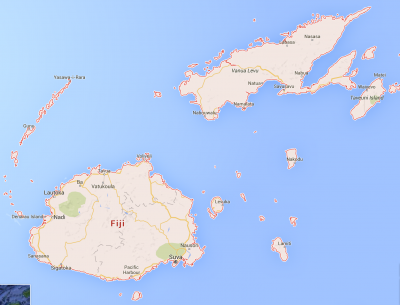 1975 – Fiji was the destination of the first major trip I took by myself as an adult. In addition to experiencing a tropical country, I was also visiting a Fijian family who my family had known previously. Canadian Pacific Airlines (since renamed Canadian Airlines, and now merged with Air Canada) offered some package deals which were good value, including air fare, local transportation, and hotel accommodation for a vacation which lasted almost three weeks. Viti Levu – is the biggest island in the group, and has the international airport of Nadi located on the West Coast. Most resorts are located on the Coral Coast (between Nadi and Suva on the SW coast). I visited the capital of Suva which is located on the rainy South Coast. While in Suva, I took a Boat trip and visited with my Fijian Family. Vanua Levu – is the second-largest island, and has the small town of Savu Savu, a small airstrip, and numerous resorts. I stayed at Namale Plantation – most of my experiences on Vanu Levu are based from here.